Mirror photos by Gary M. Baranec Bishop Carroll’s Adie Divido (14) and Alyssa Martinazzi celebrate their win over Kennedy Catholic. KITTANNING — Bishop Carroll Catholic coach Bob Gongloff has been his team’s harshest critic during the playoffs. 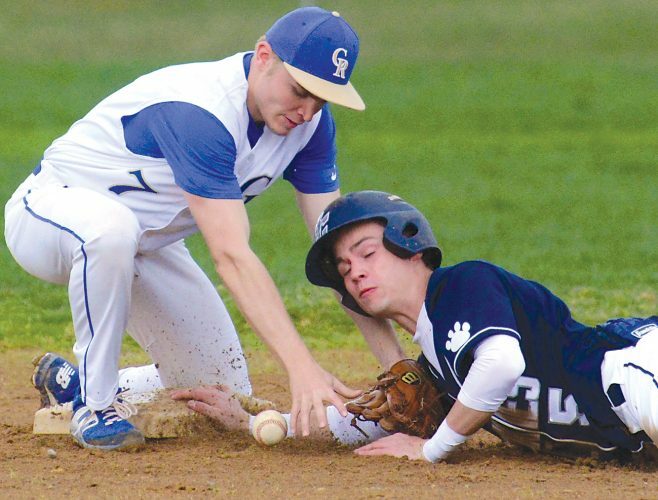 Despite cruising through the first two games in the PIAA Class 1A bracket, Gongloff said his team needed to show him more. The Lady Huskies finally put a smile on their coach’s face Saturday at Armstrong High School. Alyssa Martinazzi scored 22 points, Emily Kutskel added 10 points and 13 rebounds, and the Bishop Carroll bench filled in nicely when the starters ran into foul trouble as the Lady Huskies topped Kennedy Catholic, 58-48, in the 1A quarterfinals. Bishop Carroll will play Juniata Valley on Tuesday in a rematch of the District 6 1A championship for a chance to go to the state final. The Lady Huskies looked well on their way to victory when Martinazzi’s layup in the second quarter put them ahead, 23-10. Soon after, Kutskel picked up her second foul, and Kennedy Catholic got back into the game. The Lady Eagles went on a 12-0 run fueled by eight points from Malia Magestro, who led all scorers with 23 points. With Kennedy Catholic on the verge of tying the game on a Sophia Berardi free throw, the Lady Eagles were called for a lane violation that wiped the free throw away. Carroll scored the last three points of the half and stretched the lead to eight by the end of the third quarter. Kennedy Catholic pulled within five in the fourth quarter, but Bishop Carroll shot 21-of-24 from the foul line in the second half to keep a comfortable lead. Anna Haigh added nine points for Bishop Carroll, including a 6-for-6 performance at the charity stripe. Kate and Mara Yahner, along with Maria McConnell, combined to provide five points off the bench and filled in admirably after Kutskel and Haigh ran into foul trouble. Martinazzi managed just one field goal in the second half after a defensive adjustment to try and limit her scoring, but the other Lady Huskies filled the void. Though Kennedy Catholic had two 6-foot players in the paint, Kutskel out-muscled them throughout the game. KENNEDY CATHOLIC (48): Magestro 8 2-2 23, McKnight 5 0-0 10, Utlak 0 0-0 0, Berardi 3 2-5 10, Figuly 2 0-0 4, Schuller 0 1-2 1, Suhar 0 0-0 0. Totals — 18 5-9 48. BISHOP CARROLL (58): Borlie 0 2-2 2, Martinazzi 7 6-8 22, Divido 3 4-6 10, Haigh 1 6-6 9, Kutskel 3 4-4 10, K. Yahner 0 0-2 0, McConnell 1 0-0 2, M. Yahner 1 1-2 3. Totals — 16 23-30 58. 3-point goals: Kennedy Catholic 7 (Magestro 5, Berardi 2); Bishop Carroll 3 (Martinazzi 2, Haigh).